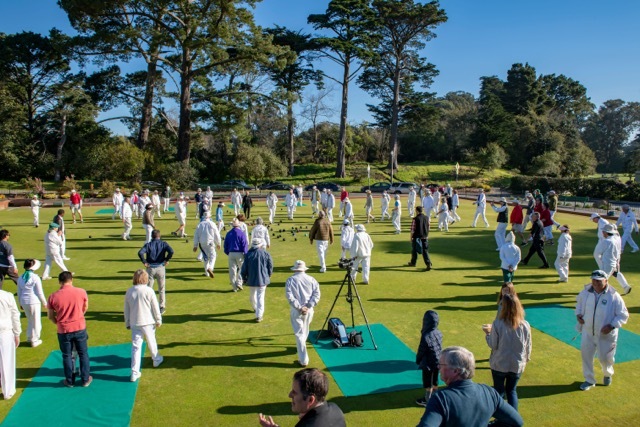 On Saturday, March 16, 120 bowlers from the PIMD met at San Francisco Lawn Bowling Club for President’s Recognition Opening Day. Our own Jim Corr was recognized as a past president, and Ian Cameron was recognized as our current president. Along with Ian and Jim, eight other members of our club–Andy, Annie, Cathy, Glenn, John, Rob, Mo and Susan Carlson–were on hand to enjoy seeing familiar faces and to meet new friends. 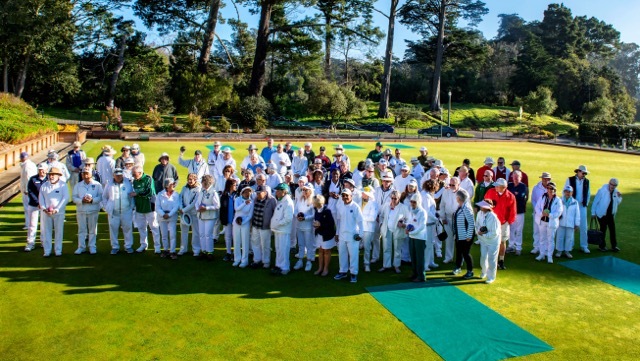 Of course there was a raffle to help raise money to pay for hosting the 2019 National Championship at San Francisco Lawn Bowling Club in September. We’ll be needing volunteers from our club to help. More about that soon! Then, everyone was ready for the bowling to begin. We played a game in the morning, took a break for lunch and played another game in the afternoon. Six of our club’s bowlers won money! (I know it’s not just about winning, but we all have to admit it’s great when we do!) Two of our novices did quite well. Novice Susan Carlson: 2nd Place in the morning game. Well done, Susan! Novice Ian: Tied for 2nd Place in the morning game, and won 2nd Place in the afternoon game. Hubba, hubba! Annie: Tied for 2nd Place in the morning game. Jim: 2nd place in the afternoon game. Mo: Tied for 2nd Place in the morning game. The weather was perfect. It was a great day!